I have one place in my house where I get enough natural light for a photograph. For about an hour from 8-9 on a sunny morning, it's bright enough to shoot without the flash there. The photographer for my books used it too. I would set up the vignettes and shots the night before and he would come early and shoot as fast as he could. He knew how to stretch the light with filters and reflectors, but the images turned out so amazing. You would never guess they were taken right here-- next to the coffee maker. So I drag everything into this tiny corner by the kitchen door. Propped on foam core panels and a chair this impromptu studio actually works pretty well since all my stuff is fairly small. That is the problem though. There is way too much of it and the little stuff is driving everyone crazy. Especially the case at this time of year when holiday boxes full of more little things come out of crawl spaces and closets -- there just isn't any room. It's like one glass ball leaves a box, tips the balance and we go careening off the edge of junk-tolerance. Even I see it. Scarey part is that no matter how much I get rid of, it is like water and just seeps back into the empty places. Because I use so much of this assorted mish-mash to make my art, I don't know what to give away. (Picture 10 bottles of buttons right here within eyeshot. How would you choose?) So, after the holiday, I am really going to try to simplify in this new year...to take it down several notches and pass it on. If you know me, you are laughing...ooh, been there, heard that. Someone suggested a book called Scaling Down. What do I treasure? 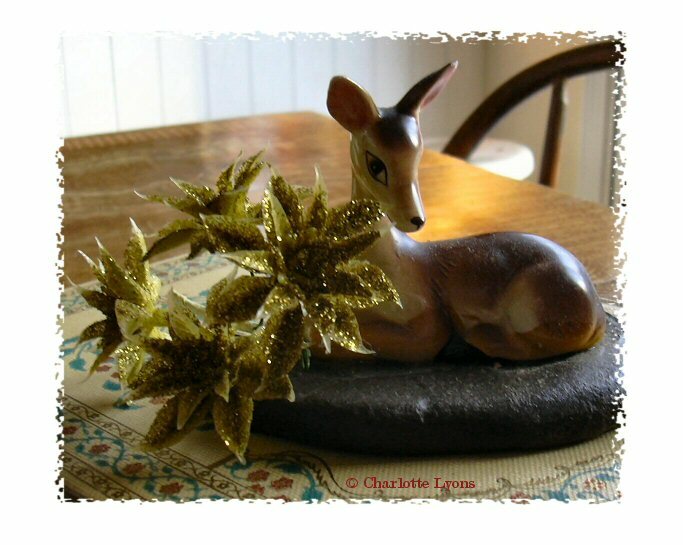 This baby deer was my gift last year from Maggie. Just a china figurine glued onto a flat rock that Maggie found out west in a thrift store. We added some sparkle and think she looks so happy right here on the table waiting for a place to call her own. There's a spot...somewhere.